Because we recently ate loads of tasty foods in Chengdu, I asked our friends Agnes and Cez, China experts, to share their recommendations for foods you must eat in China. 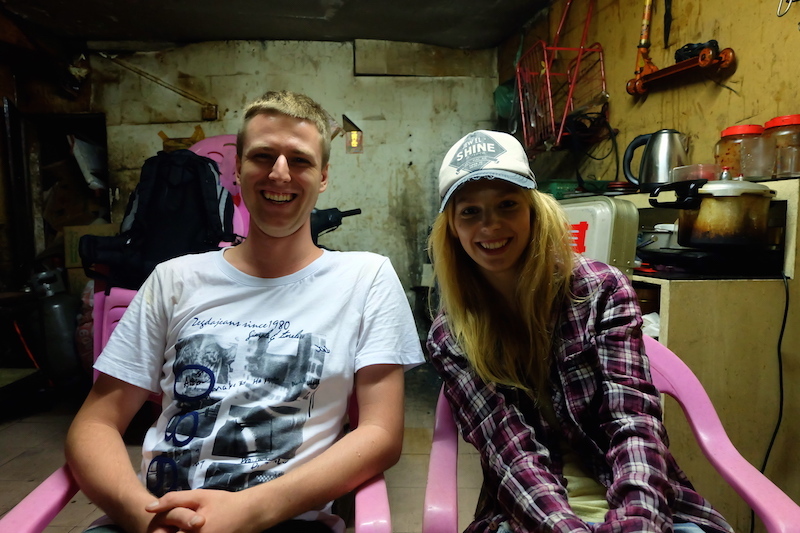 Agnes and Cez are typical foodies who love to discover new flavors when traveling across the world. Living and teaching English in China on and off since 2011, they managed to try a great variety of traditional Chinese dishes. They share their culinary experiences on their travel (eTramping) and food (Run Agness Run) blogs. Check them out if you are looking for some food inspiration! There’s a reason why Chinese food is so popular among worldwide travelers and locals. Chinese cuisine is, above all, extremely tasty, aromatic and very colorful. It is also diverse as you can find extremely spicy meals in the Eastern part of the country, sweet in the South, salty in the North, and West is characterized by its sourness. In this way, everyone can find something for themselves when visiting different parts of China. 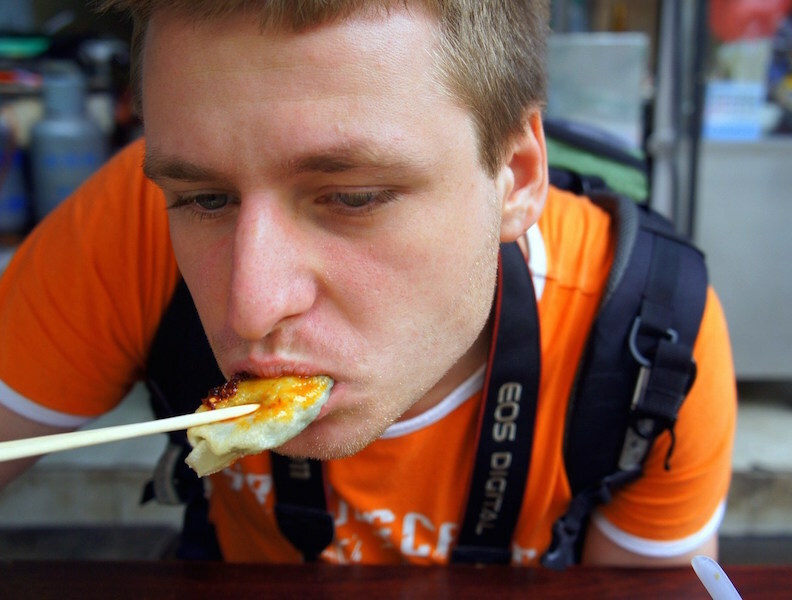 Cez enjoying his jiaozi – traditional Chinese dumplings. Additionally, dining out in China is very affordable so you can eat more and pay less. Superior restaurants are much cheaper than you think, whereas the street food costs nearly nothing! Agness ready to try some fried pork with rice and veggies. 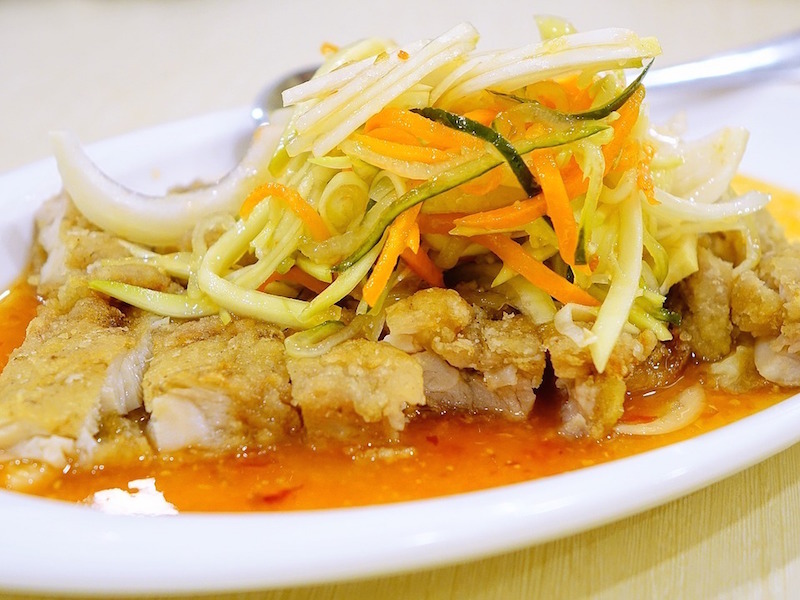 Since we know that Chinese cuisine is worth tasting, let’s check out some of the top dishes you must eat in China when visiting the Land of Dragons. This dish is a perfect dinner option as it combines sweetness and sourness. It is served everywhere across the country so you can find it in small and big cities in any decent restaurant. The chicken is very crispy and tastes amazing when served with fried rice. This is by far my favourite dish in China. I often find myself ordering it when I go out with my friends in Shanghai or Beijing. You can order a glass of wine as well as it fits this dish perfectly. 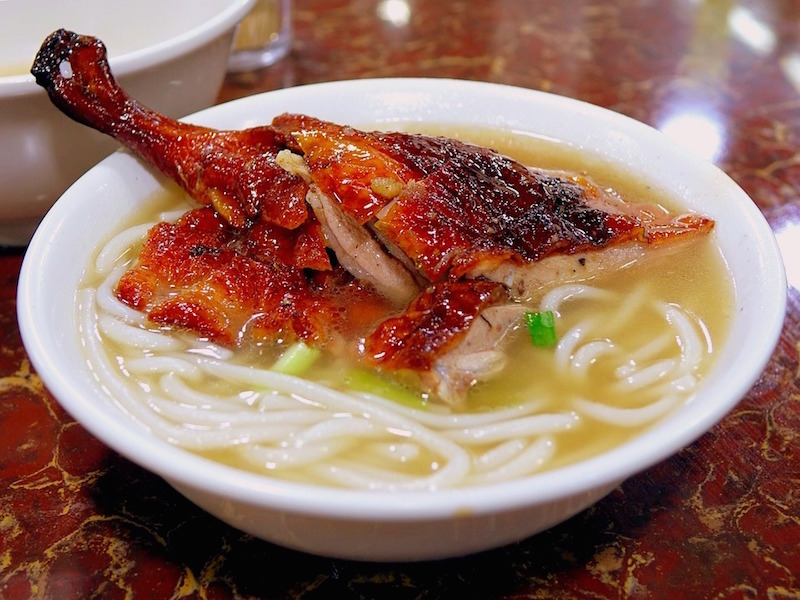 Crispy goose is a traditional dish served in the Southern part of China, well-known for its roasted meat and BBQ taste. You will definitely love its taste – crispy skin and tender meat. The goose is often seasoned with various spices and served with a bowl of rice. Not trying it is simply a sin! This is a typical street food that is sold by locals everywhere. Very tasty and quite spicy, it contains a lot of fat so don’t eat too much of it. Chinese people love to have it during their summer barbecue with friends dining outside (and usually heavily drinking beer). 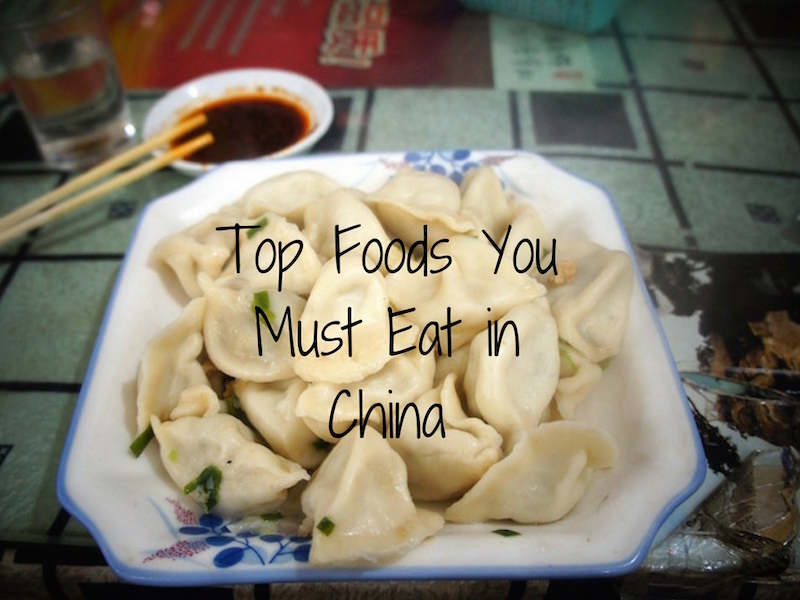 If you make it to China, trying baozi and jiaozi is a must! Both are dumplings, but what’s the main difference between then? 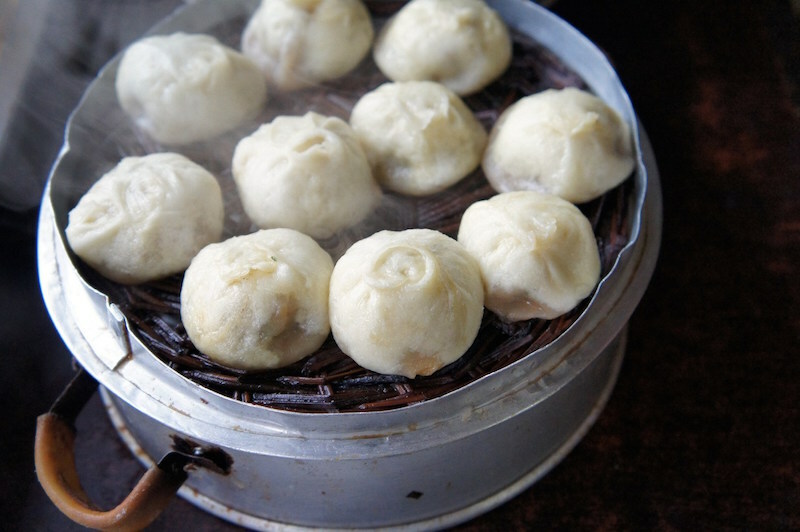 Baozi are much bigger than jiaozi, they are steamed and filled with meat (mince) and veggies (carrots and cabbage). They can be consumed daily and will fill you up quite quickly. Jiaozi are eaten during the Chinese New Year and they are not only popular in China, but also in South-East Asian countries, especially Vietnam and Thailand. They look tiny in comparison to baozi, but you will find them more crispy and salty if they are fried. 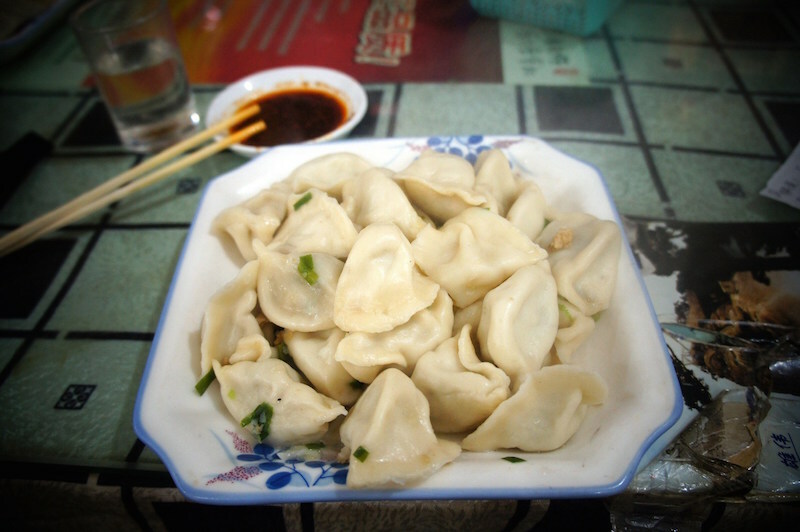 Jiaozi is also easily found in local eateries, served throughout the day in baskets where they were previously steamed, and also put into soups instead of noodles. It’s hard to spend a few days in China without eating either Jiaozi or Baozi. 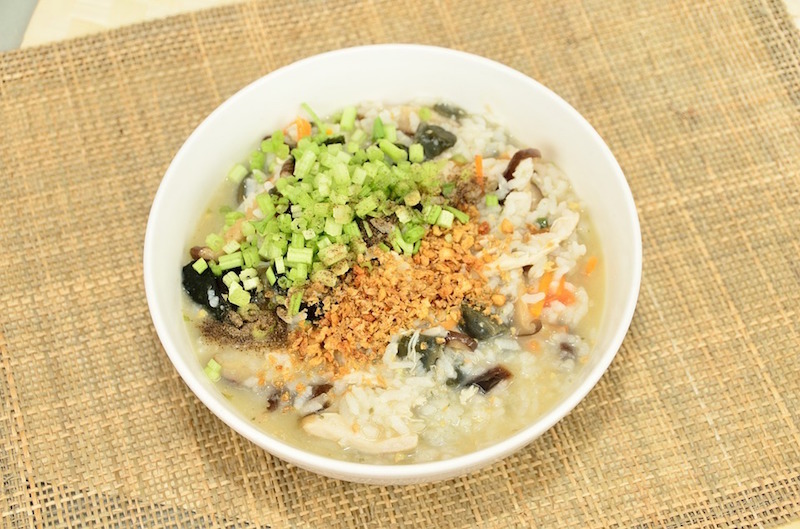 Congee is a typical breakfast option for everyone who eats healthy. It’s a rice porridge that you can eat plain or with such steamed veggies as carrot or sweet corn. Some locals love to have it as a side dish, some eat it with fish or fried meat. It’s very thick and filling. If you are visiting China in summer, a fresh mango pudding is must-try! It’s very lite and healthy and you can dig into it right after a dinner. This pudding is often served with an additional portion of fruits and coconut milk. Again, this is a perfect snack and dessert option, very delicious, healthy and lite. I absolutely love its texture – soft and silky. It is usually garnished with homemade sesame oil and soy sauce. Although you can taste spring rolls anywhere in Asia, Chinese ones (called chūn juǎn) have a very unique taste and smell. They are made during the Spring Festival and it takes some time to prepare them in a very traditional way. 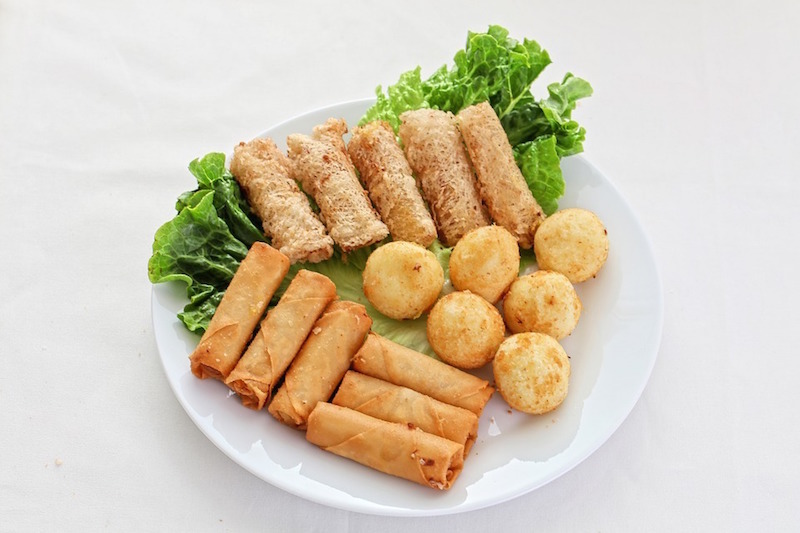 Firstly, they are filled with mince, fresh veggies and sometimes rice, then wrapped in special dough wrapper and finally perfectly fried so they turn golden-yellow color. When you order chūn juǎn, dip them in a plum or soy sauce – perfect combo. Hungry for more? Head to China and discover new flavours, new aroma and new tastes! Overall, there are plenty of different Chinese dishes you can enjoy while visiting various Chinese sightseeing spots. Be adventurous with food and don’t be afraid of trying new things, even if it’s a spider on a stick! Thanks to Agness and Cez for sharing their food tips!